The Cautioner's Tale is a post-apocalyptic graphic novel written and illustrated by R.M. Wilburn. Mary Morgan is a woman with a special gift -- she travels through time, and she’s seen things in the future that would stagger the imagination of most people. Her journal recounts the events that take place in the near future, the year is 2047 as is noted on the diner receipt which lies near a poem entitled The Dying Man. It all begins with a rigged election and ends with disaster. Mary’s mentor and friend, Dr. Parsimonious Creed, has been dead for two years now. He had been the hope of a people still reeling from the impact of the Last Great War, but was found in his home, which had obviously been ransacked, his files missing. Creed had been compiling evidence against billionaire Herr Bigly Rump, whose offer to make the world a better place was one that had to be accepted under pain of exile to the Arctic; an offer that was made suspiciously soon after Creed’s death. Rump claimed he alone could fix this, yet things had gotten very much worse indeed since his assumption of power. In the introduction to The Cautioner's Tale, R.M. Wilburn states that “Any resemblance to real persons or places is an absolute fluke”, and indeed, it may very well be a case of art spontaneously imitating life, but most readers will find ominous and terrifying parallels between the nightmare world Mary is a part of and the present state of affairs in the United States. 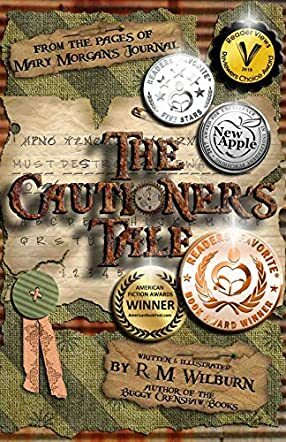 That said, The Cautioner’s Tale is a marvelous blend of fact, fiction and dark fantasy presented in a cunningly designed format that echoes the dysfunction and chaos of a nightmarish Rump dictatorship over a broken world. Each page of this graphic novel is a delight to read, examine and wonder over. I’m not sure how Wilburn put this amazingly crafted work together, especially considering the reference, at one point, to recent history, but perhaps, like Mary, the author has been doing some time-traveling of her own. This is a work that’s both grim and gorgeous, with just a hint of hope to leaven the dark storm brewing overhead. The Cautioner's Tale is most highly recommended. The Cautioner’s Tale is a beautifully produced graphic novel by R.M. Wilburn (author of the Buggy Crenshaw books). It purports to be from the pages of Mary Morgan’s journal - a lady who, in a future world gone awry, fought an election against mega ‘scrillionaire’ Herr Bigly Rump. In this post-apocalyptic, dystopian world, Rump, whose resemblance to the current incumbent of the White House is uncanny, sets about ensuring that history is erased and no one has access to a recently discovered element which facilitates time travel. Like any despot who has achieved power, Rump also starts to eliminate anyone who is likely to be a threat to his person or position. Mary is convinced that the election was rigged, and encouraged by secret messages from supporters, and clues found in the personal effects of friends who have been terminated, she sets out to discover the true events surrounding the election, and why Rump is determined to stop anyone looking into the past. Sifting through sometimes incomprehensible clues, she starts to piece together a plan - a plan that Bigly Rump, otherwise known as the GOB (the Great Orange Beast) is determined to thwart. Author R.M. Wilburn has created an exceptional graphic novel - The Cautioner's Tale’s artwork is simply stunning. Layer upon layer of glorious colour with intriguing artful graphics make this a hugely appealing book. The narrative is entertaining with secrets and clues to solve, and should appeal to all age groups. The ecological message and dystopian theme are current and important matters of interest to us all. But there is humour too (the adults among us may recognise some of the thinly disguised political and industrial characters). In the past, the problem with graphic novels has been the huge file sizes and consequent cost, but Wilburn has managed to create a reasonably sized PDF at an attractive price without skimping on the marvellous quality. I was able to download the book without any difficulty onto my Kindle while my head was buzzing with the endless possibilities of this storytelling medium. As computers become more and more powerful and file size ceases to be a major factor I am sure it will become an area just right for development, and I expect R.M. Wilburn will be at the forefront of this exciting technique. The Cautioner's Tale by R.M. Wilburn is the fictional journal of Mary Morgan, as she tells of her life and tales of history. Mary lives in a time where people are oppressed under the rule of Bigly Rump, more commonly known as the Great Orange Beast (or GOB for short). Mary had run against him in the election, in hopes of protecting the world from his rule, and tried telling everyone what would happen if he won. Unfortunately, though, she lost. But Mary knew that something must be done to stop him, but every time someone is sent to try to come to terms with him, or to try to stop him, they end up dead. Will Mary ever be able to get rid of the great orange beast? I really enjoyed reading The Cautioner's Tale by R.M. Wilburn. The book is well written and super exciting. The pages of the book are amazingly designed, as it looks like a real journal and contains many images. These are very well drawn, and help to fully illustrate the characters and other items and scenes. The story has many exciting moments, and many funny parts that made me laugh. The story is very relatable and readers will find the story funny because of it. The story will keep readers glued to their seat, wondering what will come next. The characters are extremely likeable, because they are smart, brave, and hopeful. The plot is very engaging and thrilling. I like how the story was told using different mediums, such as newspapers and letters. I would definitely recommend this book to everyone. R. M. Wilburn has a dazzling imagination. She takes her reader on a fast paced, top secret mission to save the world! The Cautioner’s Tale is told in an exceptionally creative method, leaving the reader anxiously waiting to read the next installment in the series. Letters, newspaper clippings, journal entries, pictures, clues, it’s all there. Each page is chock full of interesting detail and brilliant design. The bizarre names of each character had me snickering as well as their intensely outlandish detailed descriptions. I am anxious to find out what happened to Mary Morgan, Herr Bigly Rump, as well as Parsimonious Creed! Brilliant work from R.M. Wilburn in an excellent tale of sabotage, deceit and adventure. The Cautioner’s Tale is the first book in Mary Morgan’s Journal trilogy, and is a graphic novel of political What-Ifs, written and illustrated by R.M. Wilburn. With most of the world’s population having been wiped out in The Great War (along with all historical records), Mary Morgan travels back in time, arriving at one of the most devastating moments in history. In a place where a corrupt leadership started the chain of events, leading to the deaths of billions, Herr Bigly Rump is the man in charge after becoming the much-loathed, illegitimate leader of America. With the world’s pollution at an all-time high and populations of starving and homeless people dying on the streets, Mary knows that she must act fast if she is to solve the murder of the leader of the World Leadership Council, and possibly avert the course of history as she knows it. R.M. Wilburn’s incredibly well-written (and illustrated) tale is so beautifully presented, clearly outlining today’s hate-filled, racist policies and a near-future which most of us will not survive. The remarkable similarities to today’s dangerous political climate eerily sent a terrifying chill down my spine, as Mary dug as deeply as possible to solve the mysterious murder. Her futuristic diarized log is presented in a format which outlines a future which is far more devastating than today’s population could even dare to imagine, yet the realism is one which leaves me praying for Mary Morgan to appear. The obliteration of the world’s population through war, famine and disease is a heartbreaking reality of the future and although The Cautioner’s Tale prompted me to think hard about today’s current affairs and the shocking results that tomorrow might bring, it left me frustrated at the amount of people out there who seem so blinded by each and every distraction that is gleefully thrown at them, while the important issues are overlooked by the man who can make a difference, yet chooses not to. The Cautioner’s Tale is thought-provoking, frighteningly realistic and, while terrifying, I definitely recommend it to all readers aged 12 years and over, so they might find a way to make tomorrow a better place.